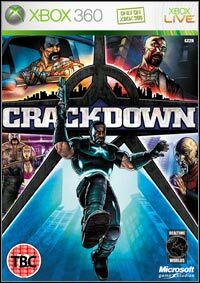 Crackdown is another, after All Points Bulletin, production of Real Time Worlds development studio, which was founded by David Jones - the father of the famous and controversial Grand Theft Auto series. This time we are dealing with a dynamic action game/TPP. Crackdown™ pushes the action-driving hybrid genre into the next generation with the first ever truly 3-D playground. Enforce justice by any means necessary in Pacific City, a crime-ridden urban center primed to explode and ready for you to explore. Enter an interactive world where anything can be used as a weapon as you clean up the streets the only way you know how. Your way. Developed by Scotland’s Real Time Worlds exclusively for Microsoft Game Studios and the Xbox 360™ console, Crackdown is the brainchild of Dave Jones, the creative genius behind many innovative game titles. * True next-gen visuals: Harnessing the amazing power of Xbox 360, Crackdown players enforce justice against the backdrop of a crime-ridden metropolis that is massive in scale and meticulous in detail. The game's unique presentation employs a highly stylized rendering technique that turns it into a living, breathing graphical novel. * Double the mayhem: From the initial conception, Crackdown has been built to feature a dynamic and engaging co-op experience for double the action, carnage, and intensity. * Free-form gameplay: For the first time ever, every inch of an urban playground has been designed for you to explore and exploit. Use any route necessary as you take down the crime syndicates, going under, around, or through the environment however you choose. * Over-the-top action: Get the job done, no matter what it takes. Any strategy or tactic is acceptable, so long as you re-claim the streets. Unleash the awesome powers of your agent, developing his full genetic potential, becoming faster and stronger, learning bone-crushing moves, using outrageous weapons, and defying certain death at every turn. * Environmental weaponry: Low on ammo? Never a problem. Thanks to an amazing amount of props and a deep physics system, you can use whatever you get your hands on as a weapon: Trash cans, vehicles, even people. Set the scene for mass destruction with a game that remembers your actions better than you do. Gather vehicles to assemble barricades, build epic piles of explosives, push it to the limit. Crackdown can take it. Game score 7.78 / 10 calculated out of 539 players' votes. Expectations before the premiere: 5.0 / 10 calculated out of 1 players' votes. Los Muertos, Volk, Shai-Gen walkthrough and more. Developed by Scotland’s Real Time Worlds exclusively for Microsoft Game Studios and the Xbox 360™ console, Crackdown is the brainchild of Dave Jones, the creative genius behind many innovative game titles.